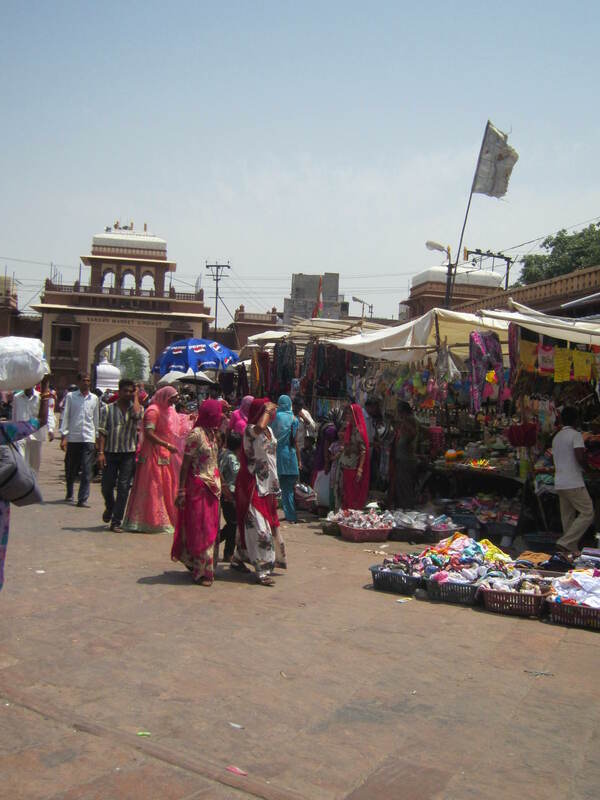 We traveled from the Pink City of Jaipur to the Blue city of Jodhpur on our journey through Rajasthan. It was hot and dusty as we pulled into town but the setting sun washed the city in the most inviting glow. 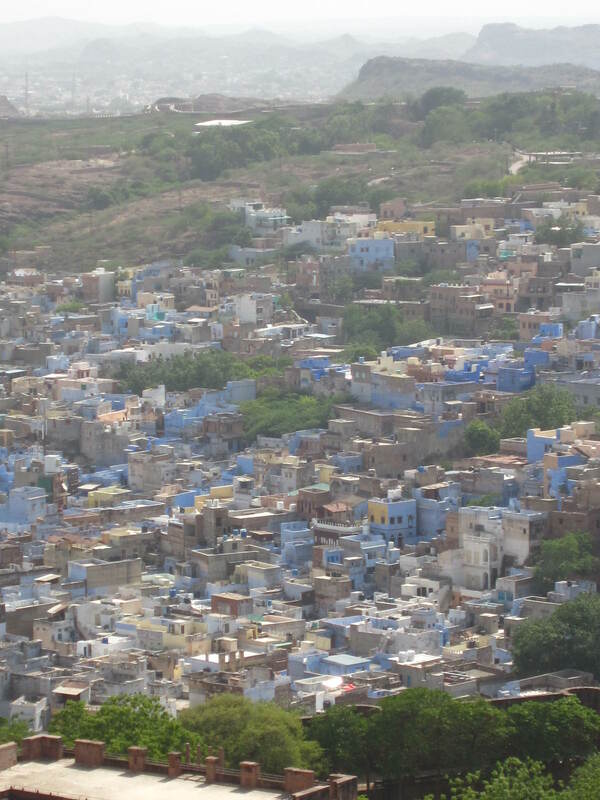 We headed for a late afternoon tour of the Mehrangarh Fort, which mightily looks over the city below. 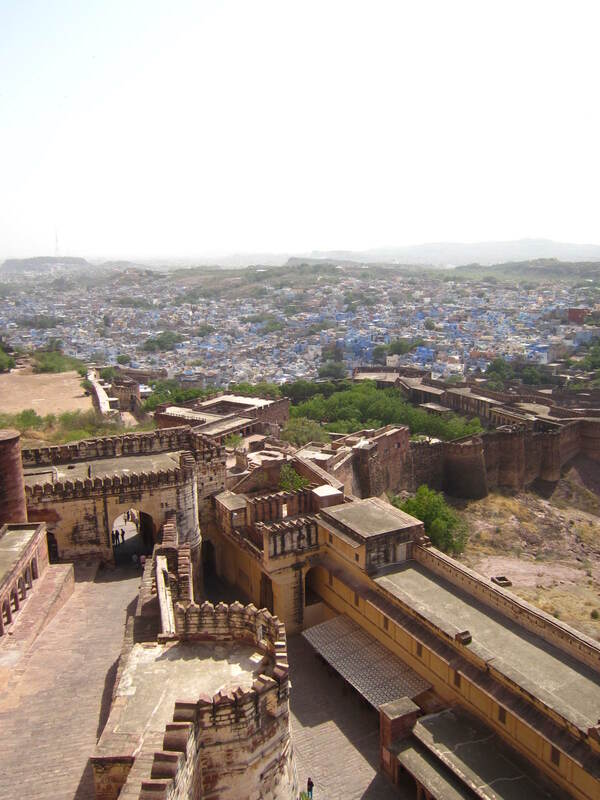 Mehrangarh Fort has been around since 1459 and each ruler has added to the structure over time. 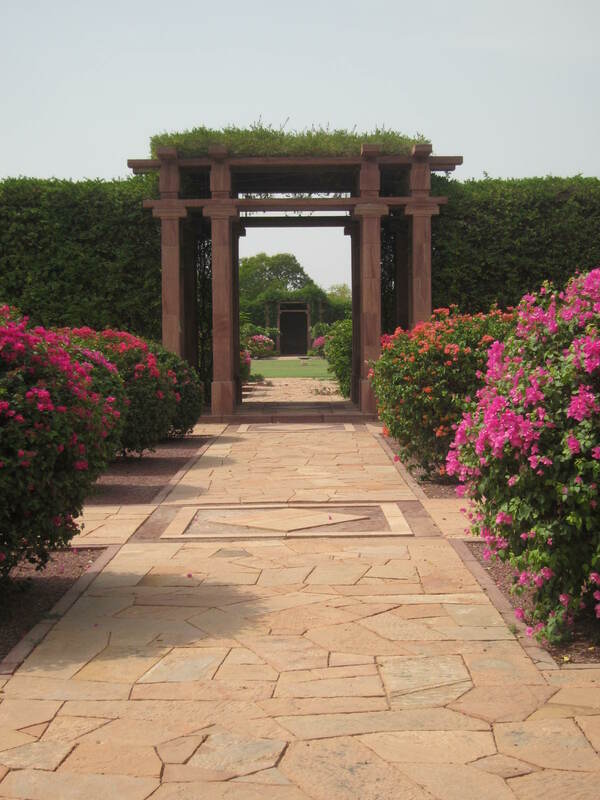 The carved stone details, the immense doors and brilliant courtyards are breathtaking. The fort’s museum also houses a collection of tapestries, ornate royal baby cradles and thrones used to carry royalty on top of elephants. 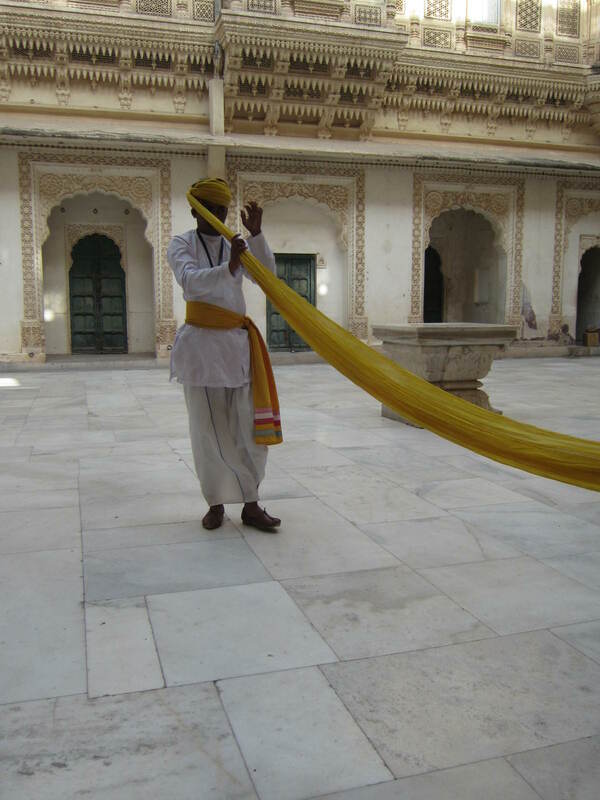 We passed through many courtyards and rooms in the Fort and one of my favorites was Moti Mahal, the Hall of Private Audience, where the Maharaja would have important, private meetings. 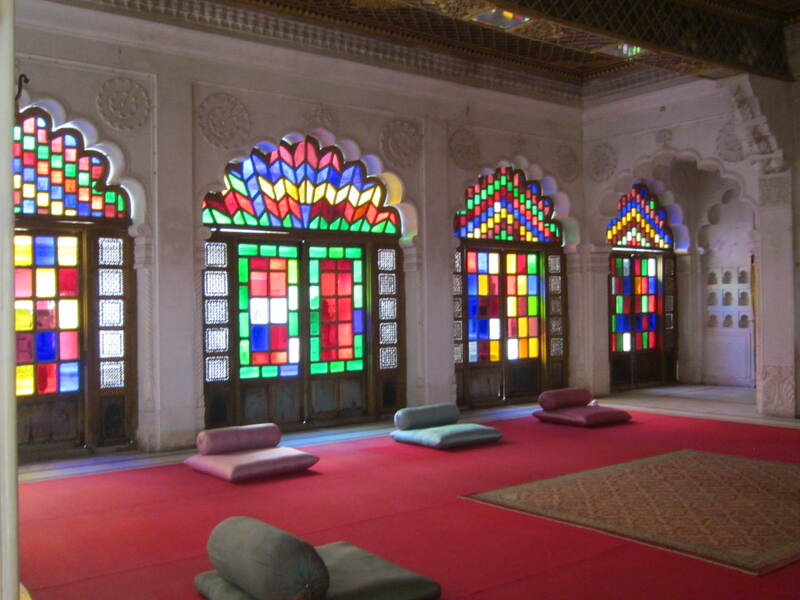 In this room there were small carved windows, one for each of his wives to sit in on the meeting without being seen. Decisions were not made by him alone and though his wives were not seen, they made sure they were definitely heard. Many of the windows and chandeliers were made with glass imported from Belgium. 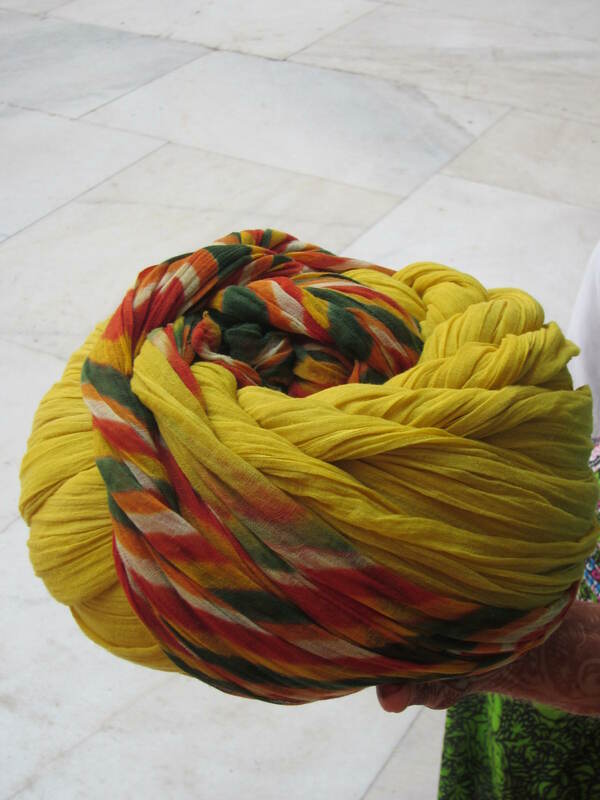 We were also given a private lesson in turban tying by one of the Fort’s guards. 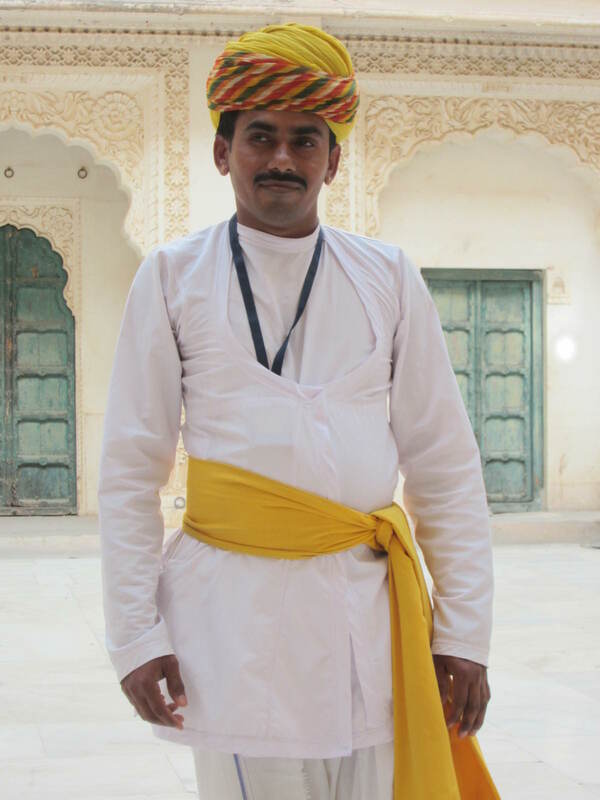 The wrapping and wearing of turbans is an honored tradition in Rajasthan and they are donned with the utmost pride. Later, we hit the streets of the city center in search of local goods. Spice shops line the main street, but if you take a stroll down one of the smaller alleys, you’re bound to find local shops offering the same goods at half the price. 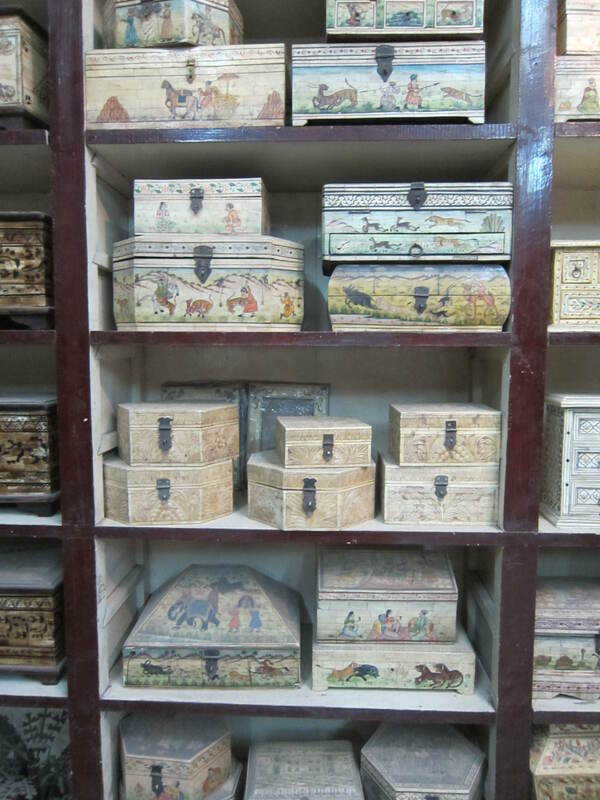 We ended up in a small shop that houses carvings and small trinkets but once you head up the uneven, stone staircase it opens up into a textile treasure trove. 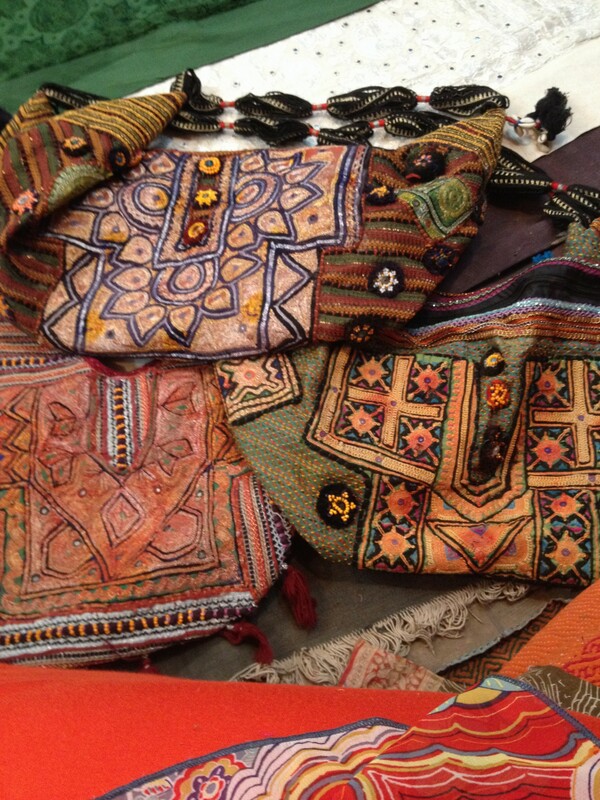 We picked through bedspreads, bags and scarves and I left with these beautiful bags made from reclaimed sari pieces. 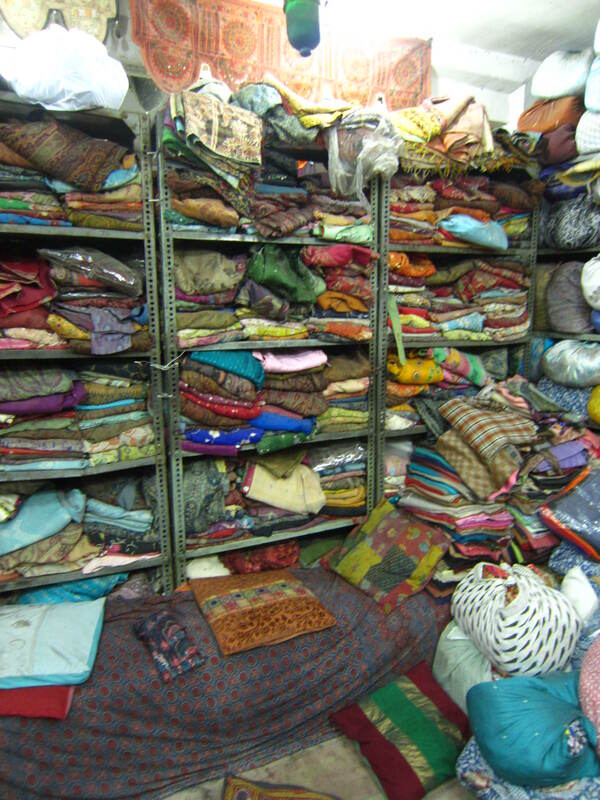 We also walked through Sardar Bazaar, located in the city center. It’s more of a local market with different sections selling bangles, second-hand clothes, oh and you can even get your tooth pulled by the “dentist” set up on the street! 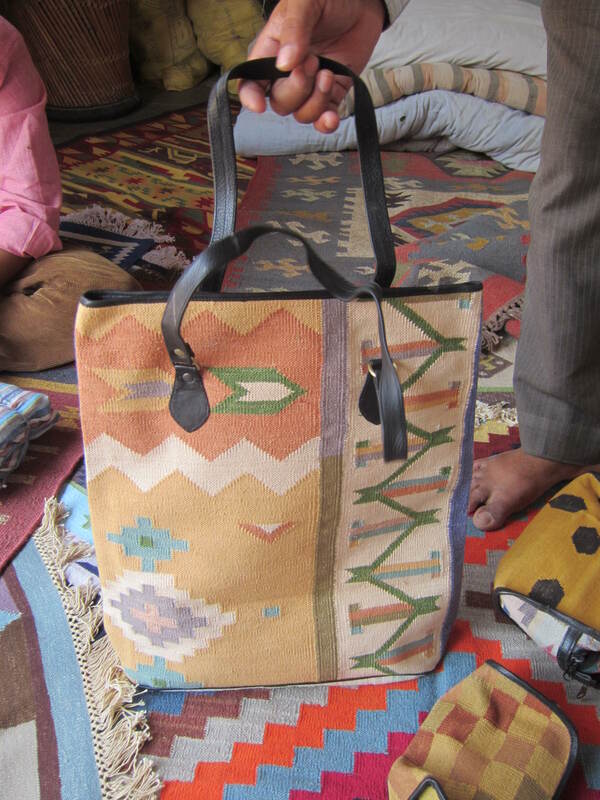 The next day we drove to the outskirts of town to visit some of the Marwar Craft Villages, located in the arid, rural desert of Jodhpur. 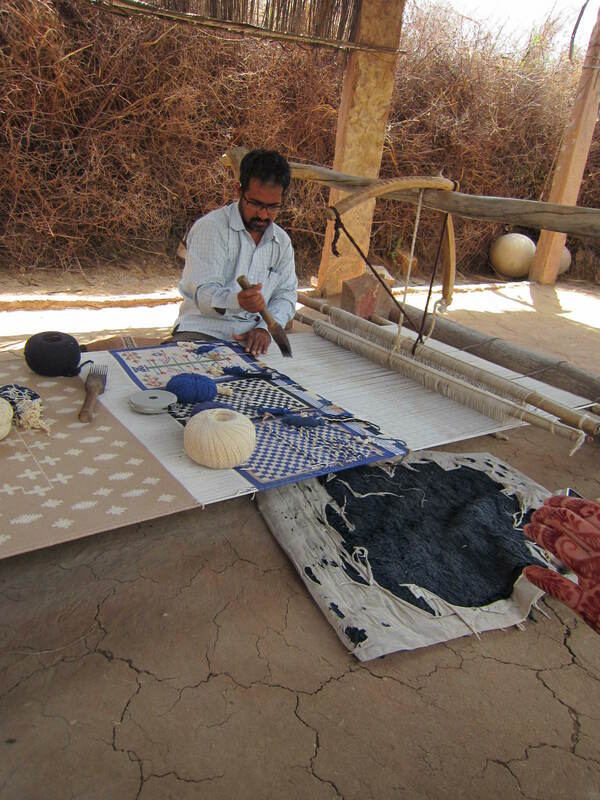 It was a wonderful opportunity to see how different families live and the variety of crafts that are created by hand, with skills passed down through generations. 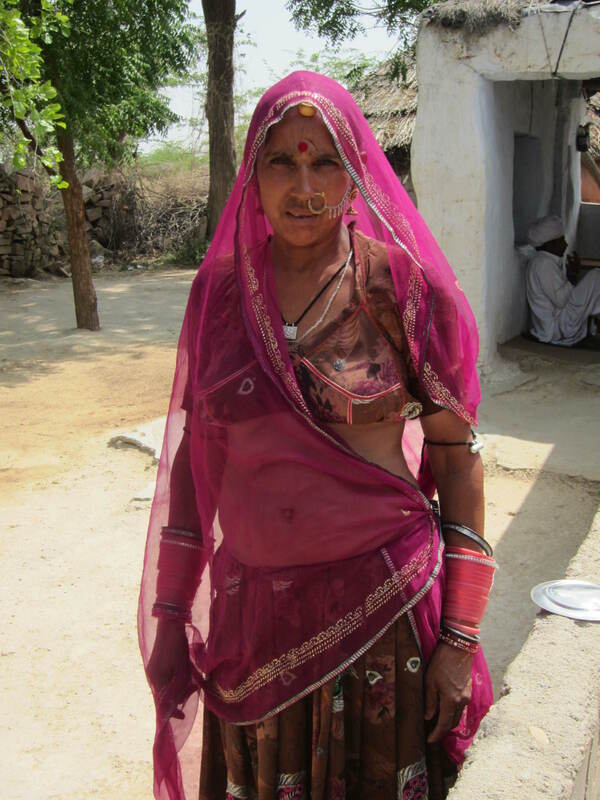 We first visited a Bishnoi village. 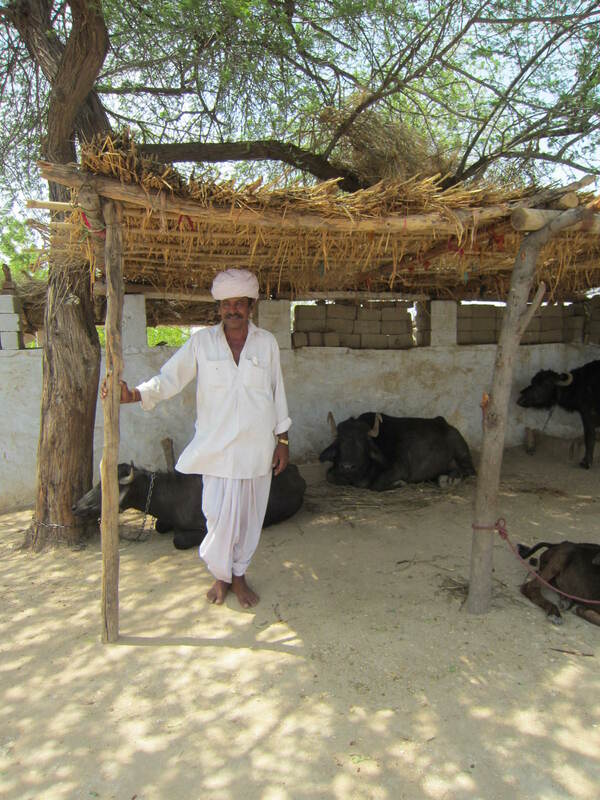 The Bishnois have a set of principles that they abide by, most of which are in respect of the environment and animals. The men wear all white, while the women are wrapped in bright colors and draped in jewelry. 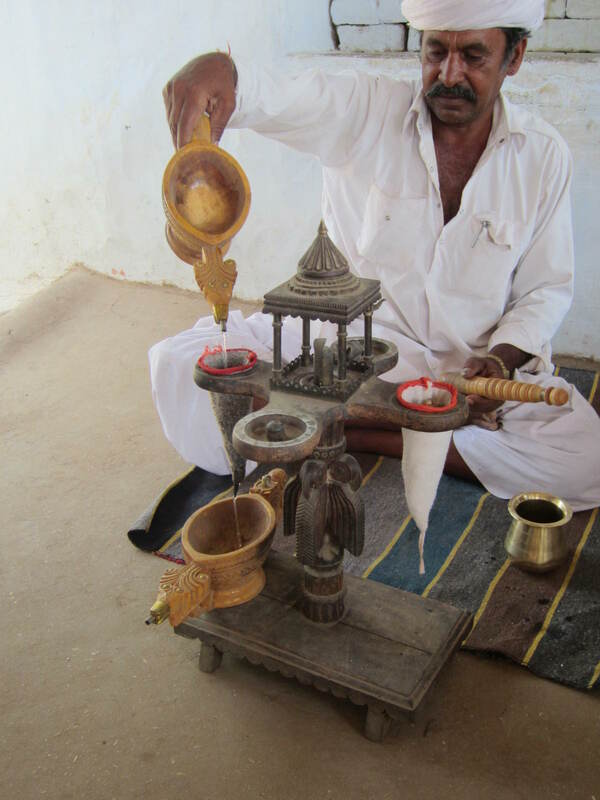 The Bishnois also partake in opium as a way of life and we were provided with a demonstration of how it is filtered and consumed. 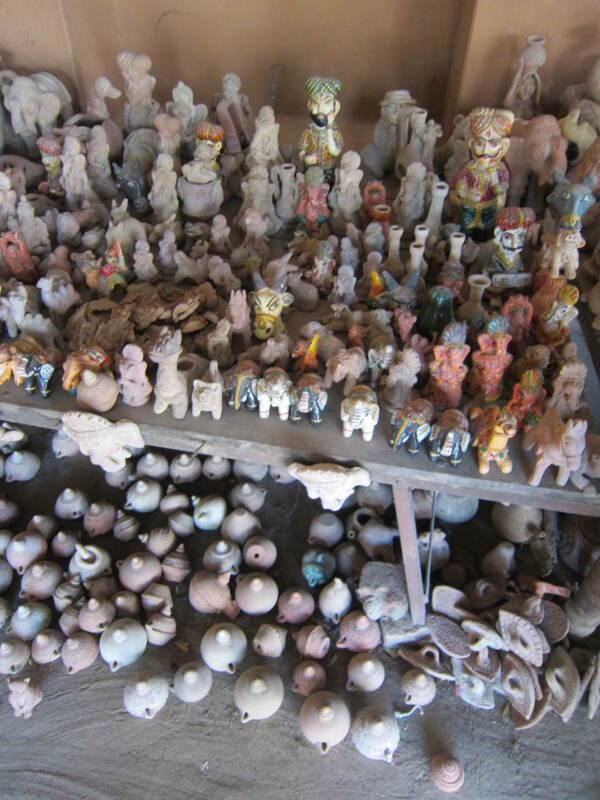 We then headed to Kakuni, where families are known for their pottery skills. 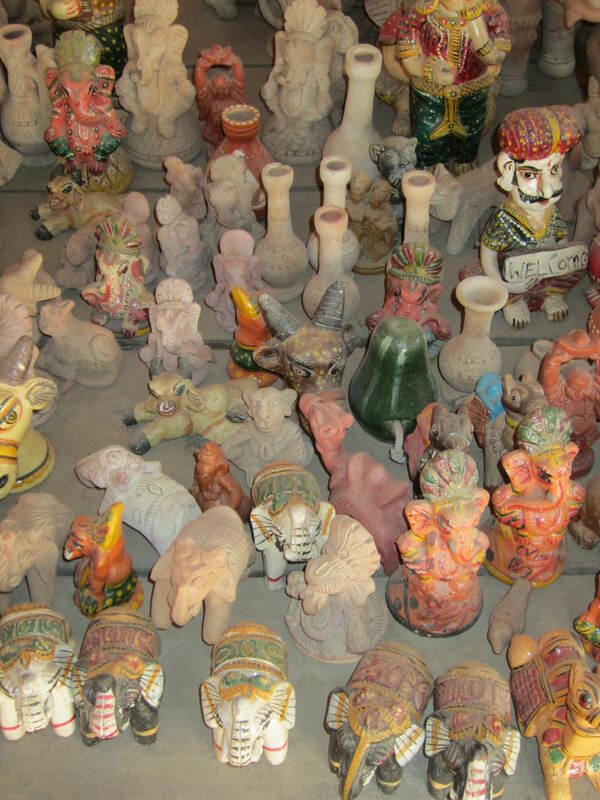 While they create some decorative pieces for tourists, they mostly make pots for storing water, which they sell locally. 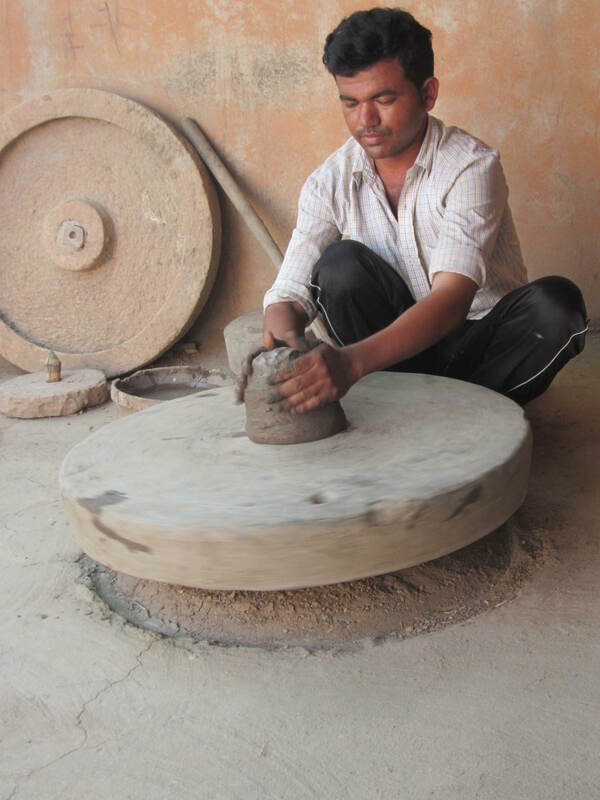 Potter’s wheel , powered by his hands and legs. Clay trinkets. None of these caught my fancy. 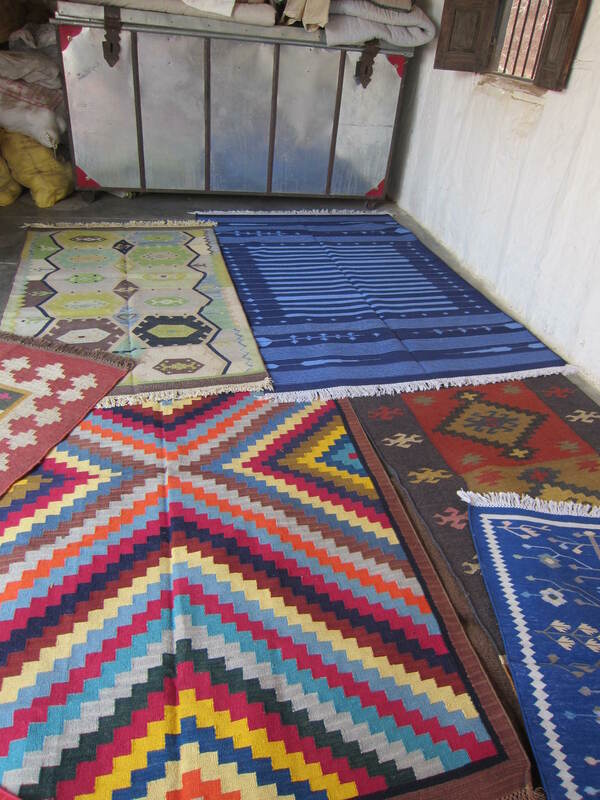 Lastly, we visited Salawas, an area known for expert weavers of traditional rugs, also known as dhurries. 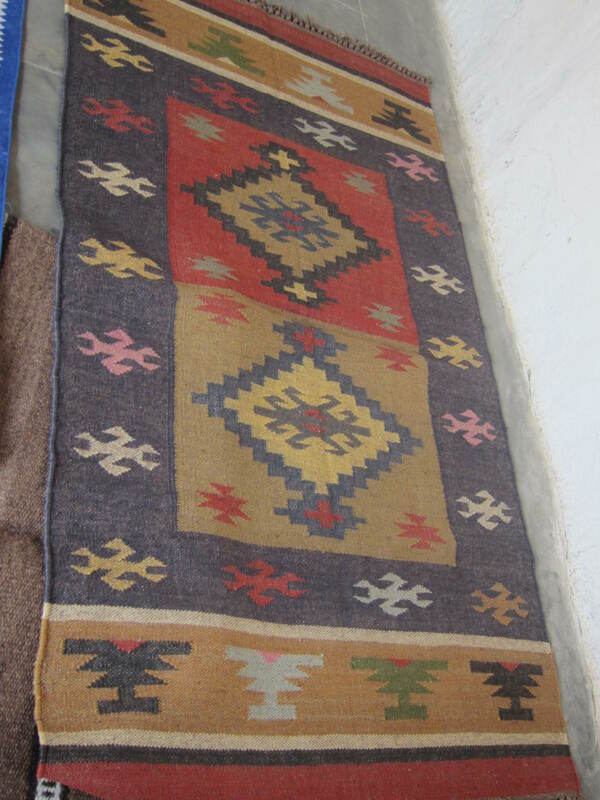 They are made of cotton or camel hair on handmade looms and colored with natural vegetable dyes. 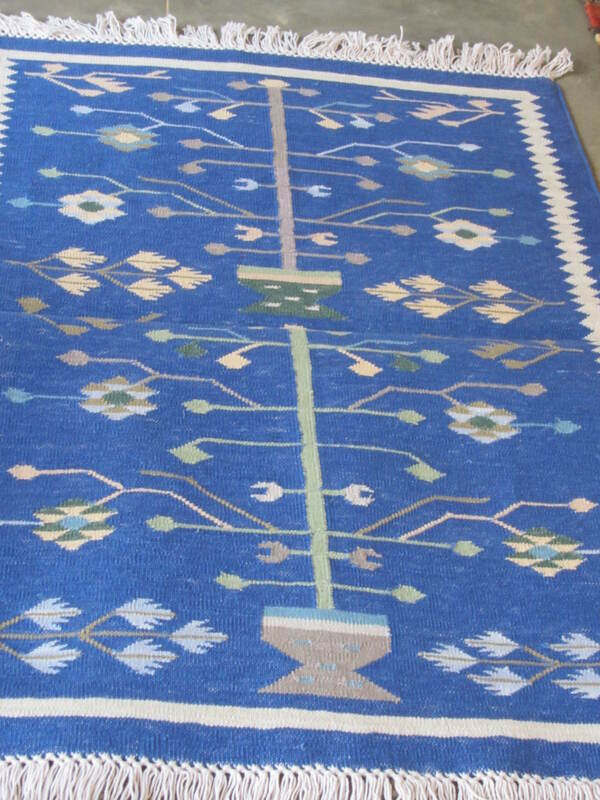 This weaving skill is taught to the men in the family and each rug can take 1-4 months to create, depending on the size and design. This super bright one almost got me, but I don’t have anywhere to put it. 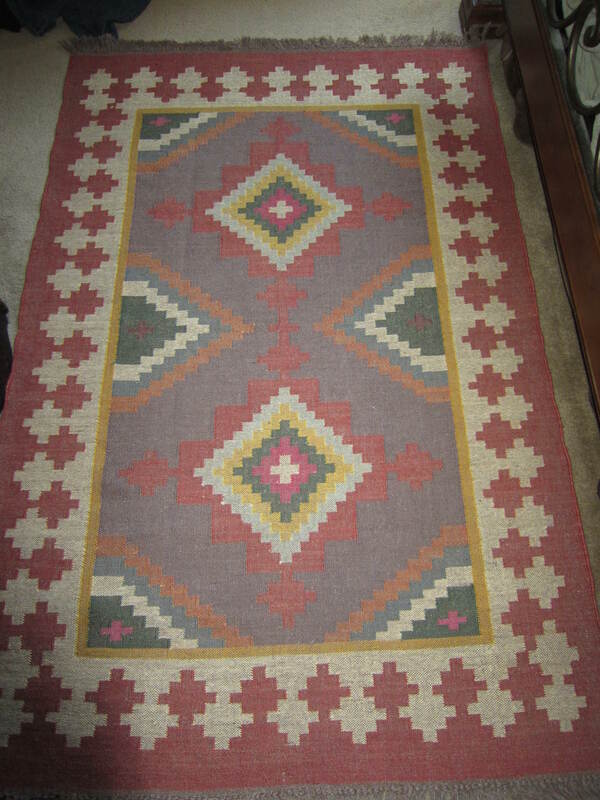 I am notorious for buying rugs when I travel. I never intend to buy them and honestly, I’ve run out of room in my place to display them. 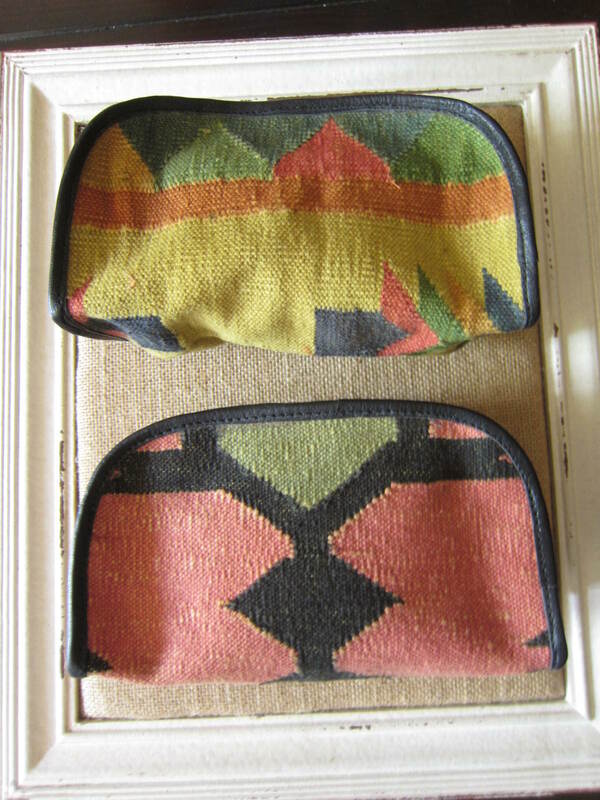 Yet, once again, I was so mesmerized by the cool, geometric patterns and color combinations of these pieces that I had to take one home. 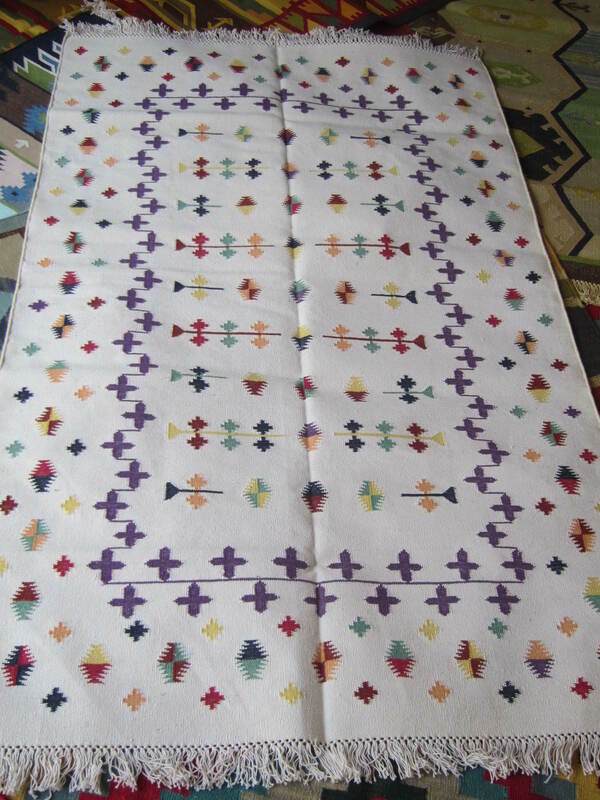 I ended up with this one, which matches the jewel tones in my bedroom and now occupies the last available floor space I have. 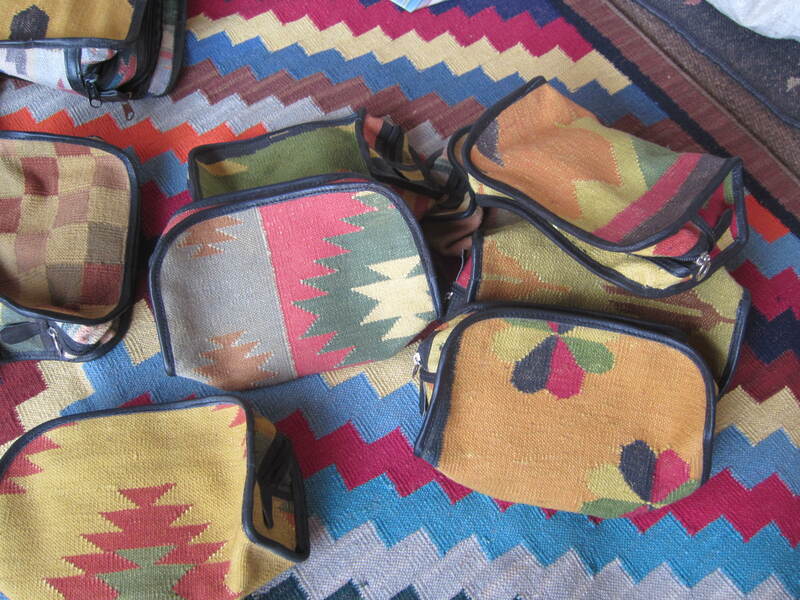 They also make handbags and cosmetic bags out of the rug pieces and I picked up two of the cosmetic bags. These are the two that went home with me. Make sure to have a sweet lime lassi. There is a tiny, hole in the wall shop, to the right side, just through the entrance to Sardar Bazaar. I didn’t get the name of the place but you’ll see the line. It was around 30 rupees and amazingly delicious. 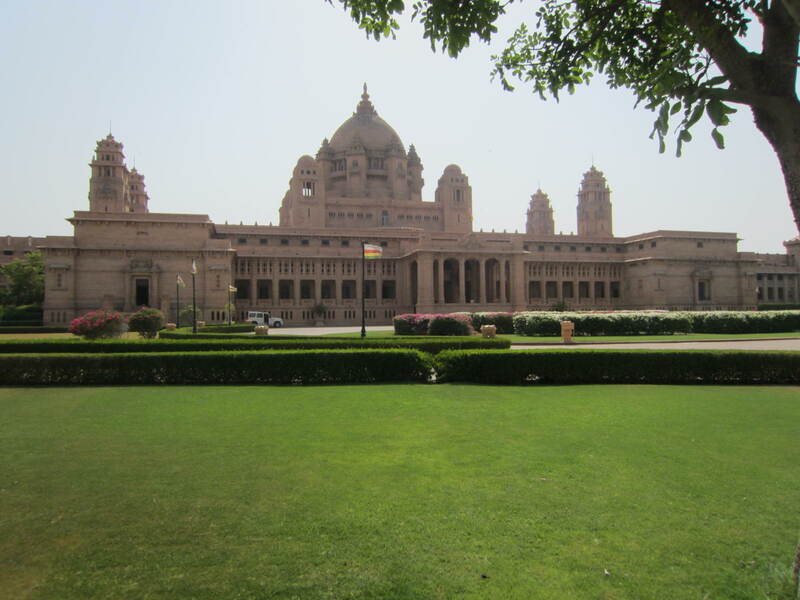 If you can, stay at Umaid Bhawan Palace. I have never experienced the level of hospitality, anywhere in the world, like I did here. You are truly treated like royalty. Head down the side streets for cheaper deals on spices and leather shoes. 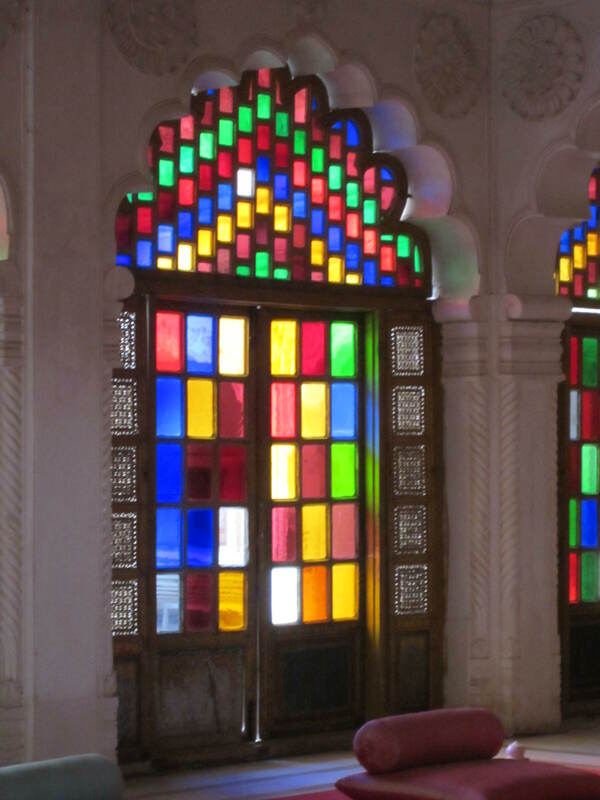 Definitely visit the Mehrangarh Fort and its museum. The miniature paintings and ornate royal décor are spectacular. Visit the craft villages on the outskirts of town. It’s a wonderful way to see artists at work as well as village life and local fauna. 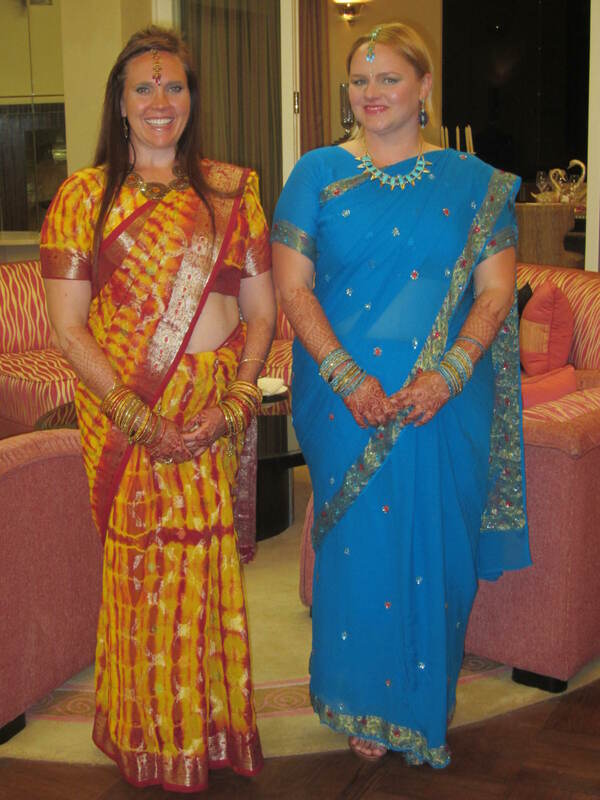 When you’re staying in a palace, get dressed up! Even if it’s just dinner for two! Live in the moment! All dolled up for dinner at the Palace! Thanks for sharing all of the many talents so many were displaying, all of these crafts/arts are so beautiful and when you to get to see what it takes to produce these beautiful products, you appreciate them so much more! It’s so true. I love seeing how artists work because it does allow you to appreciate it so much more. Glad you enjoyed it!